The North America pressure guidewire market is expected to represent absolute $ opportunity of more than US$ 10 Mn in 2017 over 2016. By the end of 2024, the North America market is projected to reach close to US$ 350 Mn, expanding at a CAGR of 10.5% over the forecast period. 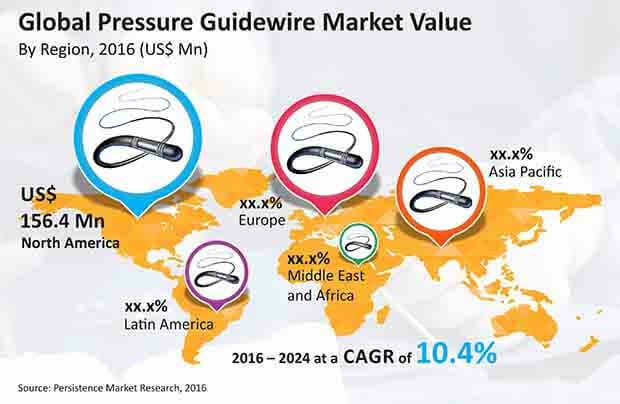 North America market is anticipated to be the most lucrative regional market in the global pressure guidewire market with a market attractiveness index of 1.6. The U.S. market was estimated to account for more than 80% revenue share of the North America pressure guidewire market by 2016 end and is expected to gain more than 150 BPS in market share by 2024 over 2016. The Canada market was estimated to account for more than 15% revenue share of the North America pressure guidewire market by 2016 end and is expected to lose more than 150 BPS in market share by 2024 over 2016. The U.S. market is projected to remain the most attractive in the global pressure guidewire market in revenue terms with an attractiveness index of 1.7 over the forecast period. Increasing prevalence of cardiovascular diseases in both men and women in the U.S. is expected to drive growth of the North America pressure guidewire market. According to the Journal of the American College of Cardiology, cardiovascular disease accounts for about 17 million of deaths per year and this number is expected to grow to about 23 million by 2030. The risk of acute coronary syndrome is expected to favor the adoption rate for pressure guidewire, thus boosting the growth of the global pressure guidewire market. In the North America region, the rise in geriatric population directly impacts the demand for pressure guidewire. This is primarily due to elderly people being highly susceptible to cardiovascular diseases. According to the U.S. Census Board, people older than 65 years represented around 13% of the total population; this percentage is expected to grow at an estimated 20% by 2030. Therefore, consistent increase in the geriatric population has been identified as a major factor fueling the progress of the pressure guidewire market in North America. Healthcare professionals in North America are also focusing on reducing invasive procedures to improve the standard of healthcare and patient comfort. FFR technology avoids unnecessary medical procedures. Pressure guidewire determines easy connectivity, direct and reliable FFR signal recovery to allow accuracy and zero drift performance. FFR guidewire helps healthcare physicians determine whether stenting or other PCI procedures are required or not. It helps in successful and timely completion of the diagnostic and treatment process. This factor is creating robust development in the pressure guidewire market in North America. The hospital end-user segment is anticipated to remain the most attractive segment in the North America pressure guidewire market in revenue terms with an attractiveness index of 2.6 over the forecast period. The pressure wire technology segment is predicted to remain the most attractive segment in the North America pressure guidewire market in revenue terms with an attractiveness index of 1.3 over the forecast period, while the flat tipped pressure guidewire product type segment is estimated to remain the most attractive segment in the North America pressure guidewire market in revenue terms with an attractiveness index of 1.2 over the forecast period. U.S based Abbott Laboratories held around 26% revenue share in the pressure guidewire market in 2015. The company has a strong foothold in cardiovascular products. It deals with both flat and agile tip pressure guidewire with pressure wire technology. Canada based Opsens Inc. focuses on optical?based pressure guidewire such as OptoWire Deux and OptoWire One. Opsens Inc. has the potential to be the key player in the pressure guidewire market with its unique and advanced technology and held around 20% revenue share in the past year.